Was Mujica’s 2013 campaign truly All-Star worthy or a mirage with an assist from a top-flight catcher? It’s time – we are now beyond the start of Free Agency at 12:01 AM November 5. We at Phillies Nation will take a look at a players, namely outfielders, catchers, starting pitchers, and relievers, who the Phillies may target this offseason. We will explore potential performance, fit, cost, and feasibility. We continue today with right-handed reliever Edward Mujica. And a reminder: you can check out all the “Pass or Play” posts by clicking on the category hyperlink. 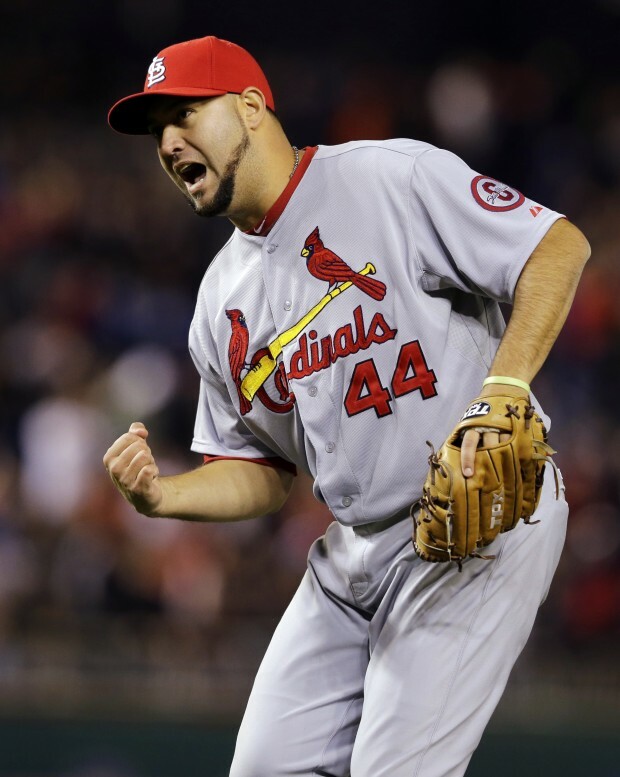 Mujica, 29 for Opening Day 2014, emerged as the Cardinals closer in 2013 before being replaced late in the season. Mujica first gained notoriety in 2012, posting a 1.03 ERA with a 0.873 WHIP in 29 games after arriving in a trade from Miami. An All-Star in 2013, Mujica limited to teams to a 0.7 BB/9 IP and a 1.005 WHIP. Mujica’s 1.020 WHIP from 2011 to 2013 ranks 15th among eligible relievers and his BB% ranks third, only behind Koji Uehara and Mariano Rivera . One of the cracks in Mujica’s game is his propensity to give up homers, something that haunted him even in the pitcher-friendly confines of San Diego (1.5 HR/9 IP while a Padre). While Mujica ranks in the bottom half of relievers from 2011-2013 in flyballs given up, he is among the 25% of relievers whose flyballs are most likely to be homers. As mentioned when talking about Joe Nathan, Jose Veras, Grant Balfour, Joe Smith, Pat Neshek, and others, the Phillies’ bullpen was ranked 14th out of 15th in ERA, FIP, and xFIP in the National League last season and there are not a ton of promising bullpen arms that the Phillies haven’t yet seen in the Majors. Unlike Neshek, Smith, and Veras, Mujica is prone to the long ball at a greater than average rate. Putting Mujica in what was the Majors’ most homer friendly ballpark in 2013 probably wouldn’t be a good fit. According to the FanGraphs crowdsourcing project, Mujica may want to ask between $4-5 million per year for 2 years. The Phillies can afford Mujica and Mujica is a veteran relief pitcher. This one is “plausible”. Mujica was average or worse in a pair of pitchers’ parks (Miami and San Diego) prior to reinventing himself in St. Louis, paired with a great catcher in Yadier Molina. The peripheral stats still indicate that he is likely to give up a number of homers and Mujica in Citzens Bank Park could very quickly turn sour.